You already know you need video to grow your business. You know you can create your video with just your smartphone and upload it to your favourite social media platform. You know you’ve got great content ideas for your videos and you know you have an audience that want to watch them. 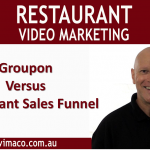 For many business owners, video marketing is a compelling proposition but there are some hurdles that need to be overcome such as lack of time and skills. But the greatest challenge for many seems to be simply getting in front of the camera. It’s not easy, but then again, nothing that is worthwhile ever is. There are some of us that love public speaking. They can talk about their expertise for hours in front of live audience without any notes. They speak with passion and spontaneity and although sometimes they go off track, eventually find their way back to the topic. But online video is different. It needs to be more concise and focused on the topic, or your audience is a click away from exiting your video. That means you will miss out on an opportunity to build a relationship with your target audience and they will never know about your awesome call to action offer at the end of your video. So unless you are a naturally gifted speaker that is able to deliver your message in a succinct and effective manner, it’s best to take some time to prepare exactly what you want to say. An alternative method is to script your video and learn it word for word. This will ensure you cover all the points in a structured and succinct way. But writing scripts and learning lines takes time and delivering your words in a ‘natural’ way takes the skills of an actor. That means many retakes and more time editing the video. Teleprompters have been used for live television for many years and allows the presenter to appear to be looking straight into the camera lens, while actually reading a script that scrolls up. Professionals are able to read their scripts in a natural way while seeming making eye contact with their viewers. It works extremely well but does take time to master the art so that the audience don’t notice the eyes darting across the screen as they read the text. The good news is that the costs of teleprompters have become more affordable with software available for ipads and smartphones. Simply place a whiteboard or flipchart just below the video camera and the list the keywords from your script. The object is not to read a script but use the keywords to keep you on track and ensure you cover everything you wanted to in the video. Most importantly, it allows you to speak in a very natural way. Not only is this method inexpensive but it’s easy to set up and use and can be mastered very quickly. So let me know what you think. What method do you use?